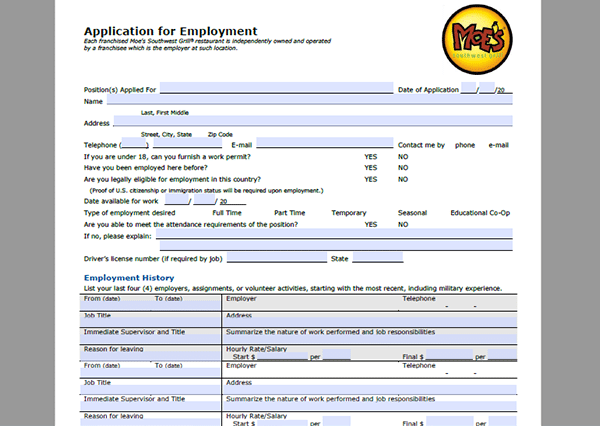 The Moe’s Southwest Grill job application can be filled out online on the company’s jobs site. It can also be downloaded (via the link on this page) and then printed out and submitted in-person at a restaurant location in your area. All management positions should be applied for on the company’s employment site. About the Company: Moe’s Southwest Grill is an American chain of “fast-casual” restaurants with more than 600 locations throughout the United States (as well as several international locations). The company was founded in 2000 and is headquartered in Atlanta, Georgia. Step 1 – Click here to open the main jobs site in a new tab or window. 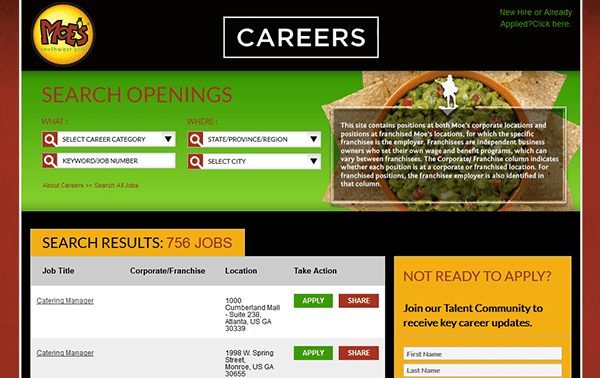 Step 2 – Search for current openings by selecting a career category or location from the drop-down lists. Step 3 – Click the link of the job that you want to start the application process for. Step 4 – Read the job description to learn more about the position, and then hit the “Apply” button to go to the next step of the process. Step 5 – Click the “Start Here” button. Step 1 – Download the .PDF file at the top of this page.